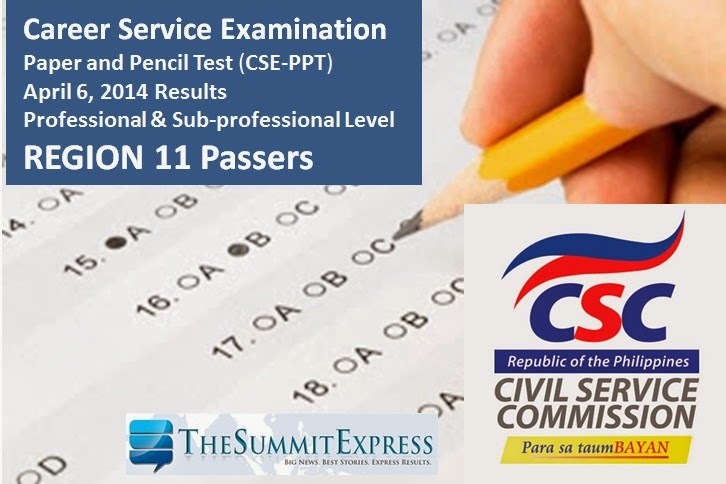 The results of April 2014 Career Service Exam- Paper and Pencil Test (CSE-PPT) are finally released online on Monday night, May 19, 2014. The Civil Service Commission(CSC) released the full list of passers per region for the Professional and Sub-Professional Examinations. Examinees of the April 6, 2014 career service exam in Region 11 (Davao Region) may now check results on this webpage. A total of 200,000 examinees took the Civil Service Examinations in 52 test locations nationwide. 179 11 409372 BUCIO, RIZA C.
201 11 403317 CABINGATAN, SHEILA MAE D.
310 11 409071 DELANTE, JOHN PATRICK C.
672 11 409076 NAPOLES, MARIAN JERICAR D.
966 11 408820 VALDUEZA, MARIETA M.
990 11 409828 VILLASON, MELVIE P.